Day 14: Hey everyone! I’m April at Red Dirt Mama and I am excited that I get to guest post here at Chelsey’s place. She’s so lovely, isn’t she? Let me begin with a confession: I live for the months of October, November and December. Everything about it makes me giddy, and since my daughter is starting to get a little older (she’s 19 months) I am beginning to think about the traditions we will have as a family. I’m completely aware that I am going to be that “crazy mom” that makes her kids do all sorts of organized activities way beyond the acceptable time frame. I only promise not to wear a seasonal sweater… for now. This year, I decided to make an Advent calendar. I hope that this will become one of those traditions that last year-after-year. I made this calendar with removable ornaments and little pockets in each one. My hope is that we fill the pockets of the ornaments with activities that we do each year in anticipation of Christmas. As Bluebelle (and maybe any other kids) gets older, she can choose the activities herself and help “decorate” the tree every year. As the activity is completed, we will turn the ornament over until no numbers are left. This way, everyone feels included and it becomes a yearly tradition! This craft was a little tedious, but I wanted to have a hand-stitched look. If you wanted to simply use a little hot glue, you could whip this baby up in no time! Want to make one?Let’s GO! Supplies Needed:1/2 yard of background felt of choice,1/2 yard of felt of choice (for tree),4-5 sheets of 8×11 felt for ornaments,1 sheet or scrap of brown felt for base of tree,glue,ribbon,needle and thread. First, I measured two pieces of felt for the background. (I made mine measure approximately 24″h x 20″w)Then I measured my interior and cut out a tree shape.Another confession: I’m really bad at cutting out a Christmas tree shape. 3rd time’s the charm, right? Then, I glued my shape and my tree base to the felt. This is a good time to position your ornaments where you find them visually appealing. I used my trusty crayon to mark the spots where I wanted the buttons to rest. Then I sewed on 24 buttons. I cut the tips off of 24 circles in order to make a “pocket” for my ornament. I decided to sew on the numbers since I couldn’t find a good felt sticker that I liked and I felt like the stitched numbers contributed better to the overall look of the calendar. Then, I sewed the ornaments together with a ribbon at the top. Finally, I stitched the finished tree to the other piece of beige felt (to cover all the stitches) and sewed in a couple of tabs at the top for easy hanging. The significance of the Advent calendar means far more to me than the calendar itself. I can’t wait to bake cookies and look at lights. I dream of unwrapping books and reading stories.Most importantly, I can’t wait to teach my daughter the true magic of Christmas and create memories that I will cherish forever. Thank you SO much to April from Red Dirt Mama! What a LOVELY guest post. I love advent calendars and I really love the idea behind this one! 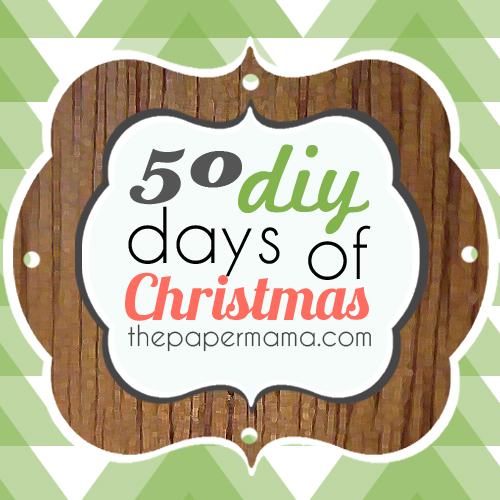 😀 Thank you for joining my 50 DIY Days of Christmas!